Happy Monday! I've been a terrible blogger lately but I promise I'm going to get better! Kyle and I just moved into our apartment in LA and last week was my first week of work. All good and amazing things but boy has it been busy. I swear I blinked and last week was gone in an instant. Also, throwback to long hair in the pic above! 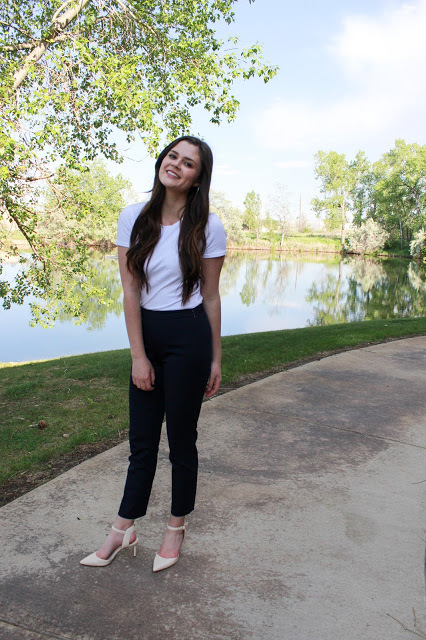 The tee, pants, shoes have been my go-to's for interviews and my first few days of work. I just got some new items today that I plan on sharing in case you all need more inspo! Until I shoot those outfits I've linked lots of inspiration below.